Disaffection with IT from the Internet bust, the technology capital spending overhang, the popular assertion that IT is now irrelevant in discussions of competitive advantage, and the hysteria about IT jobs moving overseas. The regulatory environment has put far more emphasis on the timeliness, completeness, and accuracy of corporate information. Technology is playing a foundational role in virtually every product and service. These factors are driving the priorities. 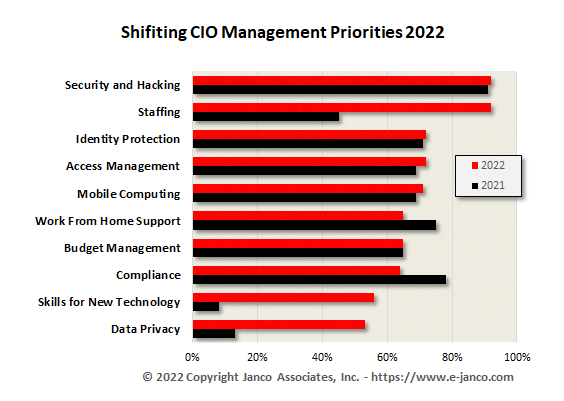 In a recent analysis of over 120 CIOs in Mid-sized companies, Janco found the most of the issues that CIOs are facing have to do with infrastructure. To address all of these priorities, Janco has created a kit for CIOs which contains the strategy, full policies, electronic forms, and job descriptions. This is a MUST HAVE kit for all CIOs and especially for individuals who have just moved into that role. 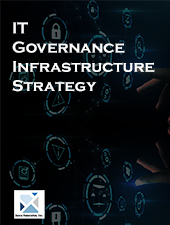 IT Governance Infrastructure, Strategy, & Charter Template WORD -- defines the framework for the IT function. Included is a ISO 27001 and ISO 27002 Audit Checklist and HIPAA Audit program. Hiring CIO - Why so Hard?